Click here for part 2: Stateless Applications. I was recently honoured with becoming a beta tester for the new Civo Cloud platform; a UK based company providing services similar to those of Digital Ocean. Civo are developer oriented and provide both a great service and great support. Since I’m on their beta list, I wanted to give their servers a hammering with my Cloud experiments and decided it would be a good idea to document what I know on Medium. This post, therefore, is the first part of a number of articles outlining how to create a distributed application load balanced on the Civo platform. You’ll start with provisioning servers running the Docker engine and linking them together to form a network ready for deploying your application services. Then, in later articles, I will walk you through creating your application, deploying it and working with more difficult concepts, such as distributing application state and static resources. Civo provides a very easy to use web-based dashboard which makes server instantiation very simple. Before you can do this, however, you will first need to set up your Civo account; the most important element of which is your public encryption key, which will be used to authenticate your development machine with your provisioned servers. Doing this will make it much easier to work with your servers once they’re up. I won’t go into detail on how to do this, as Civo has already done the hard work, here. Once your account is set up, you will then need to create your servers. To do this, simply log into Civo and navigate to the Dashboard -> Instances page, then click “Create Instance”. You should be presented with the page below. For Cloud applications, it’s best to have at least three servers. The smallest size instance should be sufficient to start and you can always increase these in time, once you are happy with the setup. When running Docker, I prefer to use an Ubuntu image, mostly because SELinux flavours, such as CentOS, often provide headaches when dealing with some Docker images which utilise known techniques, such as Docker-in-Docker. The restricted authentication system provided in SELinux distros can become a nuisance. Therefore, while experimenting, I would recommend Ubuntu. There is nothing to stop you changing your mind further down the road, once you know what you are doing. With this in mind, go ahead and create three £5 Ubuntu instances, using the root user and remembering to select your uploaded SSH key for each instance. I named mine “cloud-manager”, “cloud-worker1” and “cloud-worker2”. Now that you have your instances, go back to the Instances page on the Dashboard and note down the IP addresses of each server. You’ll need these in order to configure Docker on your local machine. If you do not have Docker installed locally, go ahead and do that now. You can find instructions on how to do that, here. Now, bring up your devices Terminal window. This will be Cmd on Windows, Terminal on MacOS and probably Bash on Linux (and if it isn’t, you clearly know what you’re doing enough to figure it out). This will install Docker onto your new server. The --engine-install-url flag may not be required. However, at the time of writing, the latest build of Docker Engine was a little buggy and corrupted when installed remotely. Therefore, providing this flag as shown above ensures that a slightly older version of Docker is used for the install, which doesn’t fail. (cloud-manager) No SSH key specified. Assuming an existing key at the default location. Note that the name used as the last parameter of this execution is the name you will call this specific server from now on, when sending it requests. Therefore, be sure to call it something you’ll easily remember. Repeat this step for each of your server instances, replacing the appropriate values for each server. 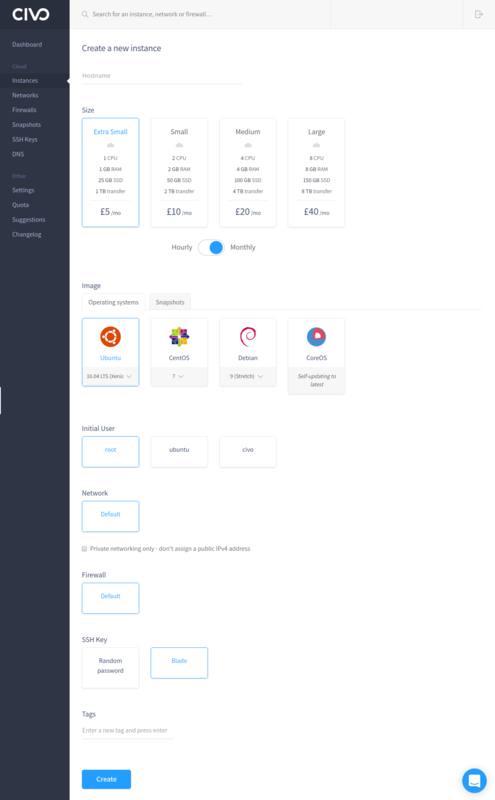 Your servers are now Docker ready and are neatly configured on your local machine for direct access. However, none of the servers are aware of each other. You’ll fix that with this next step. Linking servers is necessary as you’ll normally only ever want to communicate with a single server; the master. If you remember, I said I named my instances “cloud-manager”, “cloud-worker1” and “cloud-worker2”. Therefore, I normally send all my commands to “cloud-manager” and have that server direct the other two as appropriate. It doesn’t matter to me how it does this, so long as I know that it will. After a few seconds, you should be presented with the command prompt of the remote instance. Go ahead and exit the master server and SSH into each of the other servers, executing the join code you were given on each one. The execution should present you with the message ‘This node joined a swarm as a worker’. Congratulations! You now have a Cloud ready server cluster on the Civo platform. That’s all I’m going to cover in this article. In the next article, you’ll see how to utilise Docker Compose files to deploy a simple application to your cloud.